Philly rapper Meek Mill has officially left prison. SkyForce10 was there when a helicopter picked him up and also when he entered an SUV. Jailed rapper Meek Mill has been released from prison on bail following a ruling from Pennsylvania's highest court. In a scene that rivaled a big budget music video, Mill was driven out of the state prison in Chester, Pennsylvania, at 6:45 p.m. Tuesday. He took a short drive to a nearby parking lot, where he and his friend, Sixers co-owner Michael Rubin, were whisked into a waiting helicopter. 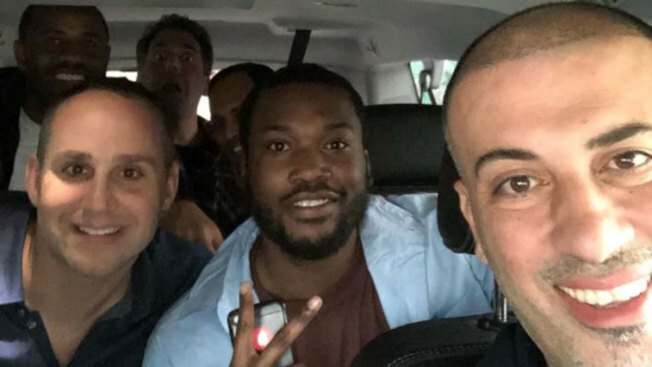 Rubin and Meek headed to the Wells Fargo Center in South Philadelphia where the Sixers are taking on the Miami Heat in Game 5 of the NBA playoffs. Accompanied by Kevin Hart, Meek rang the opening bell before the game, drawing cheers from the crowd. "I feel great," Mill told NBC10's John Clark as he entered the arena. The Pennsylvania Supreme Court ordered his release Tuesday after a long battle dating to November when the Philadelphia rapper was sentenced to 2 to 4 years in prison for violating his probation. “We are thrilled that the Pennsylvania Supreme Court has directed Judge Brinkley to immediately issue an order releasing Meek on bail," lawyer Joe Tacopina said in a statement. "As we have said all along, Meek was unjustly convicted and should not have spent a single day in jail." Mill, whose real name is Robert Rihmeek Williams, thanked a slew of people and God for their support through a post to his Instagram page. "While the past five months have been a nightmare, the prayers, visits, calls, letters and rallies have helped me stay positive," the statement read in part. In the decision, Pennsylvania's highest court cited the credibility of Mill's arresting officer, Reginald Graham, who was since been identified on a list of so-called dirty cops in Philadelphia. Tuesday's court order answered many of the concerns presented in court by Mill's legal team and by the Philadelphia District Attorney's Office. Last week, assistant DA Liam Riley expressed support for a new trial after learning that Mill's arresting officer and his testimony may be tainted. Earlier, the Philly DA's office also expressed support for releasing the rapper on bail. But Brinkley denied both bail and a new hearing last week, instead scheduling an evidentiary hearing in June. "Meek is excited to be reunited with his family, and we, along with Meek, intend to continue to shine the light on a justice system in need of reform to prevent any other citizen from being put through what Meek has endured," Tacopina said. The state's highest court also noted that Common Pleas Judge Genece Brinkley could recuse herself from presiding over any further legal proceedings, Tacopina said. Since Mill's jailing, the State Correctional Institution in Chester has become a pilgrimage site for some of the most powerful people in sports, politics and entertainment. Civil rights advocate Rev. Al Sharpton, New England Patriots owner Robert Kraft, and Philadelphia Mayor Jim Kenney have all visited Mill there. Actor and comedian Kevin Hart and Philadelphia 76ers co-owner Michael Rubin were just there hours before the court ruling. Rap icon Jay-Z wrote an op-ed in the New York Times last November citing Mill's jailing as a symbol of systemic racism in the U.S. criminal justice system. "Instead of a second chance, probation ends up being a land mine, with a random misstep bringing consequences greater than the crime," he wrote. Shortly after Mill's release, he issued a new statement saying: "Today, Meek Mill, a son of Philadelphia, is a free man. He was incarcerated unjustly and caught in a probation trap for years by a broken system. Now we can celebrate his release. We thank every individual that has supported and fought alongside Meek every step of the way"
Dozens of fans lined up outside the correctional facility hoping to catch a glimpse of him as he left prison. Some rushed to the prison's front gates in preparation. The Supreme Court ruling does not end Mill's legal woes. While he will be free on bail, he may have to face Brinkley within the next two months to discuss whether his case should be revisited. But, she could recuse herself or pass the case to the judge presiding over legal challenges related to the arresting officer. Mill's attorneys previously requested that a judge swap happen. The Supreme Court denied immediately making that change.